i was going to write and publish a book review today, but i realised it wasn’t really what i wanted to post right now. i know this is a book blog, but for me it’s also very personal. it is my life in books. books are right at the heart of me. but recently books have not been my priority or my main focus, because my life has been crazy. and so today i just wanted to share a personal post. so my apologies if you are not here for that – feel free to skip. i started to write a review today, but then something made me stop and just look out of the patio doors at the garden. sometimes i get that in the middle of writing a review – a weird blank moment where i have no idea what to say next, and i need a minute of staring into space to just get my head back on track and remember what i wanted to say. this is why i find it helpful to write notes about a book before i write a review – i often have so much to say, or some weird specific point, that it’s easy to get overwhelmed and just forget it all. personally i have been feeling overwhelmed quite often recently. my job has become massively busier in the last couple of months, for several reasons, and i have been given more responsibility – which is both good and bad. it’s that classic catch 22 where you are doing well, so they give you more work, which then means you can’t perform quite as well because you are too busy. so you don’t do quite so well. that is essentially what has happened to me since like july. i pride myself on my organisation in my job and realising that i had started to let things slip was pretty horrifying. i started researching diaries and planners, somewhat frantically, and i have started to think a lot more carefully about how i plan and use my time. it made me realise that i haven’t done as much reading as usual over the last couple of months, meaning that i haven’t been writing and posting reviews as much, which is a shame because that’s what i love to do. for me reading is massively important to my self-care and if i don’t do enough then i feel overwhelmed, and un-centred, and weird. reading is my time to myself, when i can feel calm and centred, and i don’t have to worry about anything other than being comfortable and having enough tea. it is a haven. my point is that my life has been crazy and stressful recently, and that’s why i have been a bit quiet on here, and on my twitter and instagram. in the coming months i am pledging to be more organised in all aspects of my life, to make more time for reading and blogging, and to emanate calm and zen – as much as i can! apologies for the non-book post. sometimes a life in books isn’t just about reading. back to book reviews for my next post – the review i’m currently writing is The Road Through the Wall by Shirley Jackson, and i am currently reading Life Among the Savages, also by Shirley Jackson. soon i am also going to be posting my review of A Little Bird Told Me by Marianne Holmes, which was sent to me from Agora Books, so look out for that! as always, happy reading x.
Hello dear readers – as you may have noticed, the blog has been rather quiet of late. I had a total reading slump leading up to Christmas, though I did manage to finish one book at the end of December (Miss Jane by Brad Watson) which I will review at some point. I’m currently reading Mindhunter by John Douglas, as I loved the Netflix show based on it, and I love true crime. So far it’s a fascinating and engaging book, and I am very much enjoying it. I am currently getting over the flu whilst also taking antibiotics for a chest infection, so I’m not exactly on the ball with keeping the blog updated. Life has got in the way too much recently, for better or worse. I’ve also just turned 30, which is making me feel old and weird. I am still going to review books and keep blogging, but I think over the next few months the updates won’t be too frequent – but I am still here, still reading, still being 30. I’ve just got to get the hang of fitting everything in as life changes. 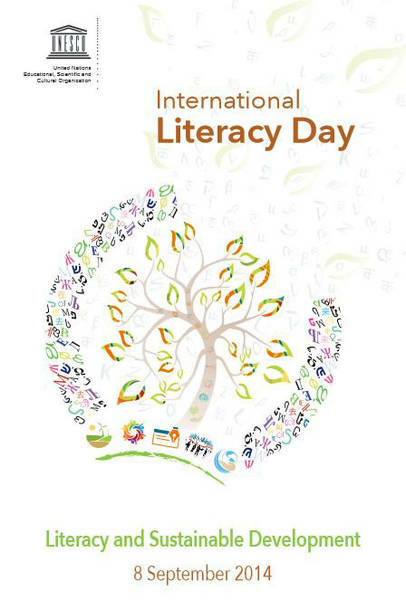 Literacy is one of those things that is very often taken for granted, mostly by people like us in First World countries with decent education systems. I for one have had a passion for literature almost all my life, and I cannot think of a world without it; indeed I can’t remember a time before I could read. Our education system is at once brilliant and flawed. We are very lucky to have it, but it does not succeed in every instance. Children with dyslexia or any other kind of ‘reading disorder’ may take significantly longer to learn to read, or be confident with reading, than their peers with no impairments. This is of course something that can be handled by special teachers and tutors, and ensuring the child gets the right support and methods of learning. But what about children who have no disorders, but their school does not have the resources to ensure their reading abilities? This is where literacy becomes a wider problem that affects people who should have every opportunity to learn how to read and write. The Independent today published this article in which they state that lack of resources, on the part of the schools but also the families, can mean that some children cannot read well even at age 11, which is utterly awful and ridiculous. The article points out that some families have fewer than 10 books at home and children are not encouraged to read outside of school – as someone who comes from a naturally bookish family this issue has always interested me. I always find it strange when people don’t have many books at home, or don’t read many themselves. Even if you are not ‘bookish’, and don’t feel passionate about literature, there will still always be a book out there for you, in some form. It doesn’t have to be difficult or long, or particularly fancy. Hell, I’d rather you read something like Dan Brown than nothing at all. Graphic novels are also probably a good way to get back into reading, if long books intimidate. Anyway, my point is that people need to want to read, and in order for that to happen they need to find something that appeals to them as well as learn the benefits of reading. Not only is it fun, you also learn new things, and it’s like exercise for your brain. It gives you a window on another world and therefore, I think, could potentially help to bring attention to lives different from yours and encourage curiosity and empathy. It’s also a skill, something I never think about as it is like second nature to me. English Literature was my best subject at school, and the subject of my degree, and so I have taken it for granted that I can construct a good sentence and express myself. I can also analyse a text and understand what is being said to me. This comes partly from studying, but also from years of reading books that were a bit too difficult for me – that is, from challenging myself. I believe that when we are not challenged we do not learn. A lack, or low level, of literacy cannot be allowed to stagnate if it “will do” or “is good enough”. I’m not saying we must all be Literature students, but I am saying that we must all learn to appreciate our language in all its forms, and be able to express ourselves well. Learning to read and write correctly improves vocabulary and expression. It builds confidence, especially in children, and is a key skill in almost all professions. There is no downside to improving your reading and writing skills. This post was written in conjunction with Grammarly’s scheme to promote literacy. By writing this I am encouraging literacy and highlighting its importance, and a donation will be made in my name to the charity of my choice – which is The Book Bus. They work in the UK as well as Africa, South America, and Asia, to bring books and literacy to children.